The idea to make tagliatelle with mushrooms came out of the blue, although it seems to be a good one. 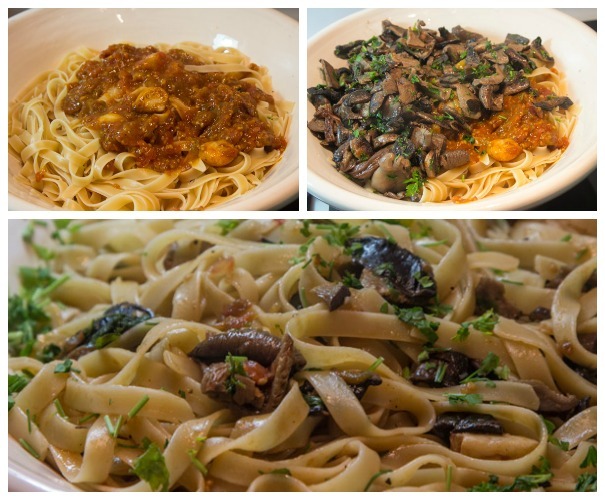 The recipe was occasioned by a dish prepared by my daughter and her friends –pasta with fresh mushrooms and dried porcini– in which the pasta was lavished with double cream! In Italian cuisine, double cream (especially if used in pasta dishes) does not dominate the dish, as it is used sparsely and selectively, and in general is replaced by creamy cheese or, in some cases, by mascarpone. Therefore, I suggest putting aside the practice of using double cream to give rich texture and taste to this dish. This old French custom of serving dishes swimming in double cream (though for no real reason) is not satisfying to the sophisticated palate, nor is this full fat version beneficial to health. Tagliatelle alla Boscaiola (Tagliatelle “of the forest”) is an extremely easy and fresh-tasting recipe for tagliatelle with mushrooms. It has no tricks, nor double cream and is an undeniable example of a simple and balanced synthesis of ingredients. Taste it and you will understand what I mean. Preparation: 20-25 minutes overall. Prepare the sauce while cooking pasta. Easy and quick recipe. To prepare the sauce: Heat well 2 tablespoons olive oil in a saucepan and add garlic. Sauté until the color begins to change and add tomatoes with their juice and press them with a wooden spoon. Season with salt and pepper, stir and simmer for 15 minutes. In another saucepan heat the remaining 1 tablespoon of oil and add the mushrooms. Stir, season with salt and pepper and cook in low heat for 5 minutes. Remove from the heat and add parsley. Cook pasta in abundant boiling salted water until al dente following the packet instructions (if pasta is Italian). Drain and tip in a large bowl or large pan and pour over tomato sauce. Mix well and add mushrooms. To serve: Serve immediately tagliatelle with mushrooms in a warm deep serving dish with grated Pecorino/Parmesan handed separately.